If you are looking for the most complex looking software then Bulk Rename Utility will surely be among the prime candidates. 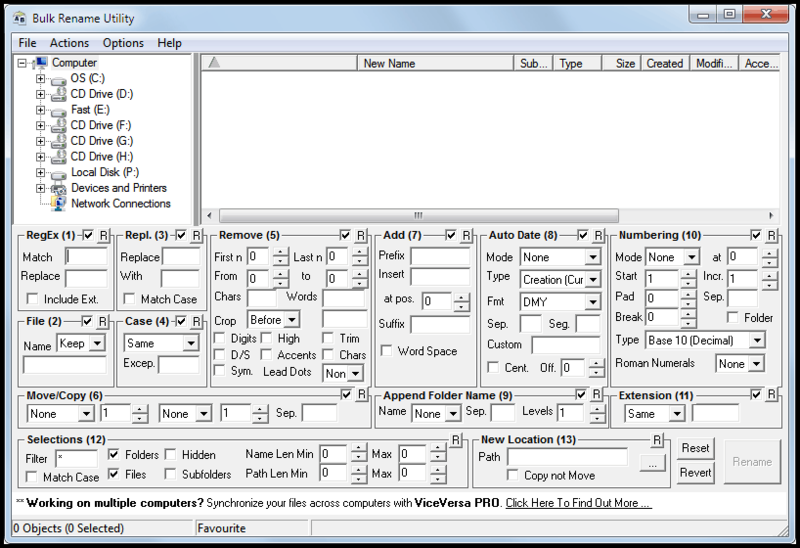 The file renaming software displays all available options on one screen, and boy, there are a lot. The software is available as a portable version, command line version and installer for 32-bit and 64-bit editions of the Windows operating system. The benefit of the installer is the option to integrate the program into the Windows Explorer context menu for easier root folder selection. 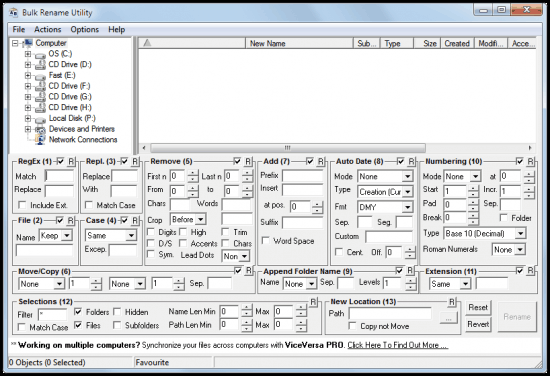 The main screen is packed to the brim with settings that all define the renaming process. The developers have sorted the renaming options into 13 different steps that are indicated by numbers displayed in the interface. It begins with the selection of a root folder; The files that are stored in the folder are shown on the right side along with information such as file name, new name after the renaming options have been processed, file type, size and various other information. The new name column acts as a preview so that it is always clear how the resulting file names will look like. 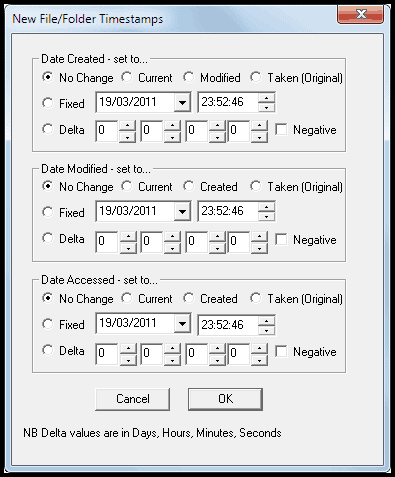 The various renaming options may look intimidating at first, users who have worked with the program for a while however will have no troubles configuring the options in short time, especially since only the required options need to be configured.The criteria are processed from left to right indicated by numbers. RegEx, Use regular expressions to match part of or all of the file name to replace it. Option to include the extension in the rules available. File, Option to keep, remove, reverse or use a fixed filename for all items. Case, Change to lower, upper, title or sentence case. Removals, Remove chars from the names, many different options. Move / Copy, move or copy part or all of the filename to a different location. Numbering, sequentially number a group of files. Extension, Change the case of the extension, e.g. lower, upper case or title. Selections, add file filters, hidden files, include subfolders, or specific minimum and maximum length of files to rename. New Location, copy or move the renamed files to a new location. Additional options have been added to the program, they are available from the Options menu at the top. Noteworthy features include changing file attributes, timestamps and character translations. Bulk Rename Utility has a few other aces up its sleeve. It can for instance rename files from a text file, remove accented characters, sort files randomly or display images in the built-in picture viewer. The program is very sophisticated and at the same time straightforward to use once the initial "omg this looks messy" reaction ends. The developers state that the program has no problems handling folders with more than 100,000 files in them, and that it can batch rename 1,000s of files in seconds. Interested users should start with the introduction of the program on the developer website. The excellent pdf manual explains every setting in the program interface, it is therefor recommended to download the manual to have it at hand during the first few times the file renamer is used on the system. The download page lists 32-bit and 64-bit downloads, as well as the pdf manual and downloads for the portable and command line version. Bulk Rename Utility is compatible with all versions of Windows from Windows NT to Windows 7. I’ve been using an older version of this for years, as I’m sure I read elsewhere that the author did not intend to develop it further. I would certainly agree about the somewhat messy look, which might well put people off and the operation is not very intuitive in places. However, I have really got to grips with it and it is most comprehensive in its facilities. I’ve found nothing else quite like it. I’ve been using BRU for years, it saves me a lot of time. But I must confess this is the first time I’ve heard about the rename from text file feature. I’ve since moved onto Ant Renamer. It’s a cute little beast that comes with a bunch of RegEx changes already built in. What’s great about it is the drag&drop functionality and even better, you can preview how your change will affect your batch file by file in just seconds. A great feature to prevent massive errors. Bulk Renamer is a more powerful piece of software but its interface causes major headaches for middle of the road users, at least those that I know personally. To me Advanced Renamer is the champ for batch file renaming. Doesn’t have a cluttered interface and has same (or more) features like Bulk Rename Utility. It also has a portable version and new explorer context menu item in version 3. Although I’m not sure if it works on 64-bit Windows. for me ant renamer is king. its (quite) clean looking and does everything i want from it (and much much more). This is the program I was looking for the last year. I just wanted to write it on my own. Thank you so much! What a mess, that interface! I’ll stick to Flexible Renamer (http://hp.vector.co.jp/authors/VA014830/english/FlexRena/) Does about the same, but in a much more transparant way. Plus, when I recently had a question, I got a replay back a few hours later. No mess, no fuss, no problems. Grade A stuff. I’m unqsutieonably in your debt. My favorite renamer for many years has been CKRename. Very easy to use and handles all the basic operations. Complex tasks like regex call for the big guns though. You couldn\’t pay me to ingroe these posts!